Constituents jeered Chaffetz, who is chairman of the House Oversight Committee, over what they saw as his failure to examine potential conflicts of interests between Trump’s private businesses and executive role. "You're really not going to like this part: The President, under the law, is exempt from the conflict of interest laws," Chaffetz told one questioner. Videos from the event posted on social media showed the crowd erupting into chants of “do your job,” in response to that answer. Chaffertz repeatedly pleaded "hold on," and "give me a second" as he was drowned out by shouting. Hundreds of people stood outside the auditorium holding signs and chanting "vote him out," while one woman was arrested. Chaffetz also faced opposition when he said that he hoped Trump would repeal the newly-named Bears Ears National Monument in southern Utah, which some present feared would lead to drilling and mining on the land. He did manage to elicit at least one positive reaction from the crowd when he said Trump adviser Kellyanne Conway was “wrong, wrong, wrong,” to have promoted Ivanka Trump’s clothing line during an appearance on Fox News this week. Chaffetz was not the only one to face hostile crowds on Thursday, with Rep. Diane Black (R-TN) also having a stormy meeting with constituents in her home state at an event held by Middle Tennessee State University College Republicans. A video posted on social media showed Black facing a chorus of boos as she was escorted out after the event. 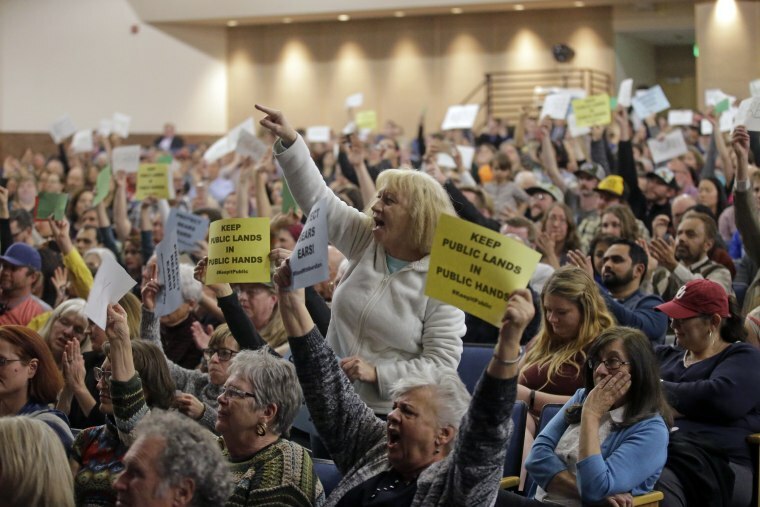 Liberal groups have been urging their supporters to flock to Republican lawmakers’ town hall events, to register their opposition to a whole host of policy initiatives, but in particular the GOP’s plan to repeal the Affordable Care Act.